We all have a unique gift, and many of us wander through life wondering what it is. Many people never realize they have a unique gift, a gift that is deeply ingrained in who they are, and makes who they are special. So how do we find our gift and what do we do when we have found it? I believe that in order to find our unique gift we have to take the time to search deep within ourselves. We need to listen to what makes us feel truly happy. My mom recently asked me if I didn't think that I had a gift and a purpose to help others, and although I think I have fought this idea (possibly through ego) I think it is something I need to cultivate more. I realize that by helping others I am giving my gift away. What could be better than that. 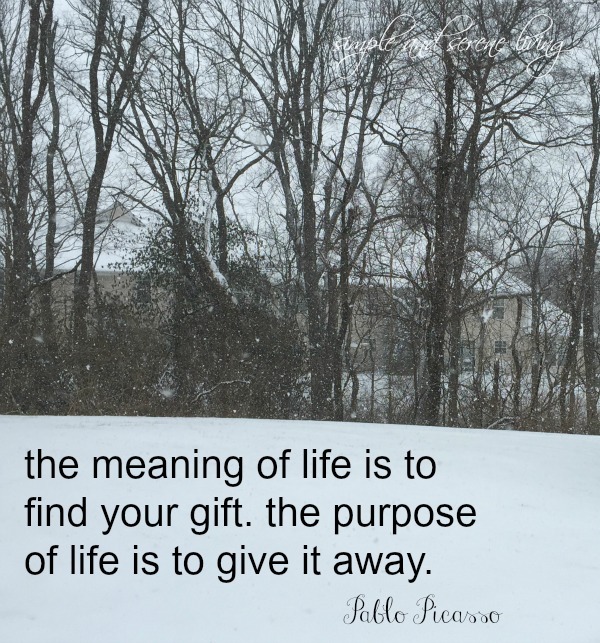 Have you found what your unique gift is, and if you have how are you giving it away? I found this article on the top ten ways to discover your unique gift. It just might help you discover yours. P.S. Read more of the Rewriting Life series here. I clicked the link and read what she came up with. All great ideas. I guess I would say that my gift is writing. Because that's what everyone has always told me, since I was a child. It is what I feel most adept at, and what I truly enjoy doing. I think maybe I started writing because I felt different from other children (didn't know then about the Aspergers), and it was my way of relating. I would definitely agree that your gift is writing, Brenda and by practicing your gift you are sharing it with others. Yes, you do have a gift of writing, Diana. I hope that my gift is teaching others and passing along a love of learning. Not always easy to tell what your gift is! Teaching is such a wonderful gift, Michelle. I am always in awe of people who teach. I think that's true. I do think that everyone has a gift. I don't exactly know what mine is other than what people tell me, which is that I have an eye for decorating. I don't really know if that is considered a "gift" though. Maybe it's the "gift for gab". ha! I've always been told that I'm never short on words. I love "the gift of gab", (my mom has that gift ) and I think decorating is definitely a gift. I think we can certainly have more than one gift, Kelly. I would guess my gift is cooking - gathering folks together for a wonderful meal. I haven't looked at the article yet - I bookmarked it to read later because I saw it asks a lot of questions and I'd like to have some quiet time to journal about these questions. But I would like to think that some of my gifts are cooking, writing, organizing and lending a listening ear and compassionate heart.